This Agreement is an offer (public offer) for any legal or natural person to conclude an agreement on the provision of services for domain names registration and support (hereinafter referred to as the Agreement). The Agreement is publicly available in line with the Article 633 of the Civil Code of Ukraine and its terms and conditions are the same for all consumers. According to the Art. 642 of the Civil Code of Ukraine the fact of payment for services by an individual or legal entity and the Contractor’s receipt to confirm the fact of such a payment is undertaken as the confirmation of acceptance of the terms and conditions of this Agreement. A proposal to conclude an Agreement (offer) is considered accepted the same moment when a legal or natural person is registering on the Contractor’s website at https://www.ukrnames.com. Subscriber is a natural or legal person who has accepted the terms and conditions of this Agreement and paid for the services provided by the Contractor. Account is an account placed on https://www.ukrnames.com/, containing information about the subscriber and is necessary for its registration, personalization and authorization. Contractor is a legal entity registered in Ukraine that provides services for the domain names registration and support on the Internet. Domain is a designation consisting of a set of characters and numbers that defines the address of websites, e-mail and other services on the Internet. Services are meaning the services of registration and support of domain names consumed in the process of performing a certain action or carrying out a certain activity. Registrant is a person (Subscriber) in whose interests the domain name registration is carried out. Registrar is a person (performer) who provides services to ensure domain name registration and operation. Transfer is a change of the Registrar of a domain name. DNS is a Domain Name System (Domain Name System). NIC-handle is a unique identifier of the domain owner in the WHOIS database. IP address is a web-address on the Internet. Primary DNS server is the main server that stores information about the domain. Secondary DNS server is a secondary server that stores information about the domain. This information is periodically updated by the Primary DNS server. MX record is an entry in the DNS server configuration file. Defines servers that accept mail for this domain. A record is an entry in the DNS server configuration file. Specifies the IP address of the domain, subdomain. NS record is an entry in the DNS server configuration file. Specifies the DNS servers that host information about this domain. ICANN is the Internet Corporation for Assigned Names and IP Addresses (Internet Corporation for Assigned Names and Numbers), an international organization responsible for IP address space management and the Internet's domain name system. WHOIS is a service designed to obtain contact information and technical information about domain names, IP addresses and other network information. The Whois service is a public Internet service (Public Service Regulations [ https://hostmaster.ua/services/] ). 1.1. The Contractor offers its services to the Registrants under the terms and conditions defined by this Agreement. 1.2. Services are provided through a web interface and specialized hardware and software. technical consulting services in the domain name registration area. 1.4. The Contractor performs domain name registration on the basis of agreements concluded with domain administrators and other registrar organizations. - and other domain zones, the rules and regulations of which are published on the official websites of these domain zones. 1.6. The subscriber confirms that at the time of the conclusion of this Agreement neither the registration of the domain name, nor the procedure for its use does not directly or indirectly violate the rights of third parties. 1.7. Services are provided to subscribers having access to the Internet and installed software for working with the web interface, based on this Agreement. 2.1. By concluding the Agreement, the Subscriber confirms that he is fully acquainted and agrees with its terms and conditions, and, if the Subscriber is an individual, agrees to the processing by the Contractor of his personal data in accordance with the Law of Ukraine "On Protection of Personal Data". 2.2. The Subscriber’s personal data is processed in order to ensure that they receive invoices, acts and other documents, carry out mutual settlements, identify and prevent violations of the Subscriber’s and/or his clients rights, violations of third parties’ rights, ensure security and eliminate technical problems. 2.3. In some cases, the Subscriber, at the request of the Contractor, is obliged to provide a written consent of third parties to the processing of their personal data. 2.4. By concluding this contract, the Subscriber agrees that the Contractor’s employees and consultants have access to the Subscriber’s personal data. 2.5. The Contractor has the right to provide access and transfer the provided personal data of the Subscriber to third parties in order to comply with the clause 2.2. of actual Agreement. If it is necessary to transfer personal data of the Subscriber for a purpose not related to this Agreement, the Contractor notifies the Subscriber about this by sending an e-mail to the email-address provided by the Subscriber. 2.6. In order to provide services of domain name registration under the Agreement, personal data of the Registrant, as well as personal data of third parties provided by the Registrant with their consent, can be transferred to the root domain registry administrators in which the domain name is registered, and also to providers, operators and WHOIS services users, ICANN, escrow agents, auditors, and to any registrar who can be assigned by ICANN to transfer a domain. - take all necessary measures to provide high-quality services. In case of any disputes between the Contractor and the Registrant, as well as with the participation of third parties, take all legal measures to protect the interests of the Registrant (Subscriber). - provide complete, truthful and accurate information in the quantity necessary for the provision of services by the Contractor. The information provided by the Subscriber, with the exception of personal data of the Subscriber, if necessary, can be published in open sources. - pay for the Services in accordance with the terms and conditions of this Agreement and the scope of services that the Contractor must provide. - in case of violation by the Subscriber of its obligations under this Agreement, terminate the contractual relationship with the Subscriber unilaterally with the simultaneous sending of a written electronic notice. The moment of termination of the contract and termination of services shall be considered the date of sending the corresponding message to the Subscriber. - provide complaints, comments and suggestions regarding the provision of services by the Contractor. 4.1. Payment for services by the Contractor is made in national currency at the rate at the time of payment and in accordance with the tariffs set at the time of the provision of services on the basis of a 100 percent prepayment. 4.2. Services are considered paid at the time of receipt of funds on the current account of the Contractor. 4.3. In case of non-payment or late payment, the Contractor has the right to suspend/stop the provision of services and is not responsible for the possible consequences of such a decision/action. 4.4. When making a payment, the Subscriber is obliged to indicate in the payment document the invoice number issued by the Contractor, and to identify the paid Services. 4.5. In the case when a paid domain cannot be registered or its validity cannot be extended for reasons beyond the control of the Contractor, the amount transferred by the Registrant can be used by it to pay for other Services or returned to the Registrant in any way available at that time minus the payment system commission charged for money transfer. 5.1. In order to use the service of the Contractor, the Registrant agrees to provide true, accurate and complete information about himself in the quantity necessary for the provision of services. Registrant have to independently maintain this information up to date. 5.2. The registrant is responsible for the security of his login and password, as well as for everything that will be done on the Contractor’s website under the Registrant’s login and password. The registrant agrees that he is obliged to immediately notify the Contractor about any unauthorized (not allowed by the Registrant) access with the Registrant's login and password and/or any security breach, and also that the Registrant completes the work with his password ( "Exit") at the end of each session of work with the service of the Contractor. The Contractor shall not be liable for possible loss or damage to data that may occur due to the Registrant’s violation of the provisions of this part of the Agreement. 5.3. The registrant undertakes to indemnify and protect the Contractor, as well as the corresponding domain zone administrators (including Verisign Inc., Neulevel, Inc., Public Interest Registry, Afilias Limited and other registries listed at http://www.icann.org/registries/listing.html), as well as all officials, managers and employees of these companies and organizations from any claims, damages, liability, losses and expenses, including any reasonable attorney fees and expenses arising from services provided by the Contractor under this Agreement . 5.4. The registrant agrees not to reproduce, repeat or copy, sell or resell, and not to use any part of the service, use of services or access to them for any commercial purposes, except when such permission is given to the Registrant by the Contractor. The Contractor shall not be liable under any contract between the Registrants and third parties. 6.1. In order to protect the Registrant's rights to use a registered domain name, as well as to ensure an effective and universal procedure for registering and managing domain names registered in different domain zones, the Contractor may enter its contact details to the WHOIS services of foreign, Russian and Ukrainian administrators when registering domain names. The Contractor undertakes to change the contact details of the domain name upon the written request of the Registrant after providing them with a document proving his identity. 6.2. The Contractor does not guarantee unconditional fulfillment of the order. All provided Services are provided on an “as is” basis, taking into account that technical systems may include undetected technical errors, the consequence of which is the impossibility of providing services or their late execution. In addition, the circumstances caused by human factors or force majeure events caused by social and natural disasters (wars, fires, floods, revolutions, government actions, etc.) can lead to the impossibility of providing the Services or their late implementation. 6.3. If it is impossible to fulfill the assumed obligations for the reasons specified in the clause 6.2., the Contractor shall be liable within the amounts received from the Subscriber as payment for services. 6.4. The Contractor shall not be liable beyond the limits of the amounts received from the Subscriber as payment for the Services. 6.5. The transfer of the Registrant’s domain name to other Registrar is possible not later than 7 days before the expiration of the term for delegation of the domain name. The specified period depends on the current rules of the domain zone in which the domain name is registered. - if, according to a properly executed requirement of the competent authorities (courts, law enforcement agencies), the contact information provided by the Registrant does not allow to identify the Registrant, as well as in cases where the contact information is not reliable. 6.7. If the Contractor’s DNS is used as the IP address for the domain name, the Contractor’s IP address contains the default IP address of the Contractor with the settings for the Contractor’s service web page. 7.1. Domain names in the .UA zone may be delegated only to the owners of the rights to the respective trademarks (word signs for goods and services), which are valid for the territory of Ukraine. 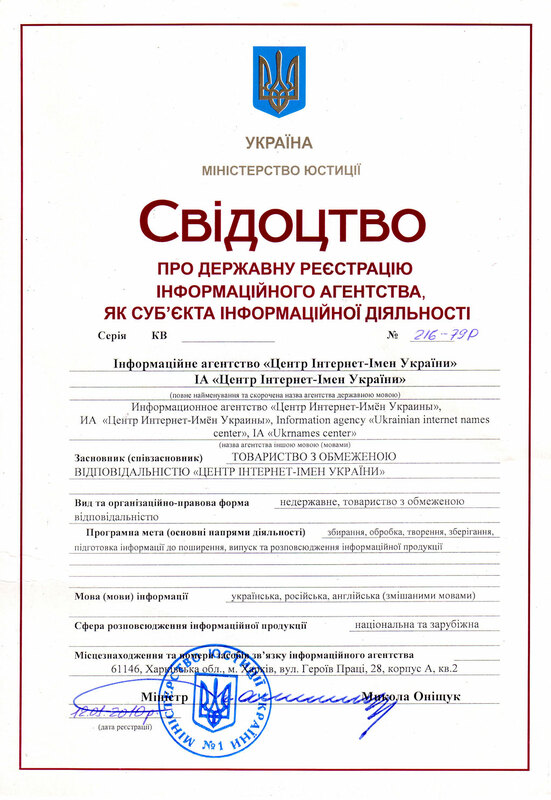 To register a domain name, the Registrant is obliged to provide a scanned copy of the Trademark Registration Certificate issued by the Gospatent of Ukraine or a certificate from the Department of Ukraine stating that such a trademark has international registration and is protected on the territory of Ukraine. The scanned document should be sent to the address info@ukrnames.com indicating the Registrant's login. Within 10 days after the registration of the domain name in the .UA zone, the Registrant is obliged to send a notarized copy of the document confirming his rights to the trademark to the address: 61024, Kharkov, PO Box 1823. Detailed information about the specificity of domain registration in the .UA zone is provided on the next page https://www.ukrnames.com/ukr/domains/ua_rules.jsp. To order a domain in the .UA zone the Registrant must indicate the number of the certificate on the Trademark. The Registrant agrees and accepts the .UA Domain Policy, that is available at: https://hostmaster.ua/policy/?ua, and also undertakes to take full responsibility in the case of providing with false information about the rights to the Mark(s) for goods and services. 7.2. Registration of a domain name in the .AERO zone can be done only by organizations and individuals associated with the air industry. 8.1. The Contractor shall not be liable for the use of domain names registered with its help, as well as of the content of any web-materials published under such domain names. 9.1. The Subscriber has the right at any time to unilaterally withdraw from the Contractor’s Services. In this case, refunds, including prepayments for Services, are not made. 9.2. The Contractor is entitled at any time to unilaterally deny service to the Subscriber without explaining the reasons; at that, money is returned to the Subscriber for the full months of unused volume of Services. 9.3. Domain name registration is subject to suspension, cancellation or transfer to another person in accordance with any specification, regulation or policy that the Registrar must adhere to or in accordance with any Registrar procedures in case it is necessary to correct the Registrar's error in the domain name or resolve disputes related to the registered domain name. 9.4. The Agreement enters into force from the moment of payment for the Services in the manner prescribed by this Agreement, and is valid for the duration of the ordered service. 9.5. For all matters not regulated by this Agreement, the parties are guided by the current legislation of Ukraine. - Within 10 (ten) working days from the date of receipt of the claim, the Contractor may state his position on the principal issues indicated in the latter and send his answer to the email address specified in the claim. In case of failure to resolve the dispute by means of a complaint procedure, the dispute shall be subject to consideration in accordance with the Agreement. - anonymous claims or claims that do not allow identifying a user on the basis of the data provided to them during registration are not considered. - The Contractor reserves the right to make a final decision on the received claim. 10.3. In the case a dispute arising in connection with the registration and use of a domain name cannot be settled in a complaint procedure, the dispute shall be resolved by a competent court. 10.4. The recognition by the court of any provision of the Agreement as invalid or not enforceable does not entail the invalidity or non-fulfillment of other provisions of the Agreement. 10.5. When considering disputes, as evidence, the parties are entitled to provide printed e-mails with stored technical information in them (headers). In case technical information (headers) is absent, such letter is not a proof. The originality of the e-mail headers can be confirmed by the Internet Service Provider, through which the corresponding e-mail was sent or by independent experts. 11.2. For the transfer of a domain name, for security purposes, the Contractor may request from the Registrant verification documents, as well as the original application for transfer.